As a little girl of 7, my younger sister and I were sent to Bath to live with my Aunt Alice at No 1 Bennett Street, Bath. On the night of 26/27 April 1942 I was blown out of my bed when a bomb exploded on the Regina Hotel just a short distance away. I was 9 years old at the time and terrified by what was happening. 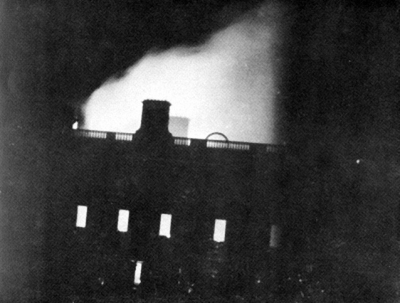 We were very quickly summoned by an Air Raid Warden to evacuate our home because the Regina Hotel and the Assembly Rooms (pictured) were well ablaze. My younger sister and I were walking in the middle of the road with no shoes on our feet. The Warden spotted my Aunt Alice who was carrying our shoes, whereupon he ordered the group to stop walking and he turned to my Aunt Alice saying "Woman have you no sense? Get those shoes on those children's feet, there's broken glass everywhere." So there we were, stopped in the middle of the Blitz with bombs flying everywhere, sat in the middle of the road putting shoes on. We eventually reached the Air Raid Shelter near the Eye Infirmary and as I remember we passed through a large archway, down some steps, and then under the main road. We were there for 3 days and nights until on the 3rd day my father arrived from Wales, whereupon we were allowed to leave the shelter to return to Bennett Street to collect some of our belongings and then back home to Wales. At Bath Spa station, a bomb had landed on one of the platforms, damaging the station building and the railway lines. The wartime damage list reads: "Blast damage to station, platform torn up, 4 sets of tracks damaged, 3 trucks demolished, others damaged. Water main damaged". We were not allowed to leave from Bath Railway Station due to the damage there, so we caught a bus to Bristol and then the train from there. On arrival home at Porth railway station my mother and all the family were there to greet us and my mother was overawed at the sight of us. "How on earth are you so dirty and black?" she said. But my father quickly explained to her that we had been in an Air Raid Shelter for 3 days and nights without access to water except for drinking purposes. I have many memories of Bath from those days, but by far the best were the small streets and shops by the Theatre Royal and in particular the coffee shop where they roasted and ground their own coffee. As I write this I can almost smell the Aroma of Coffee from those childhood days. If my Aunt Alice couldn't find me after school, my cousin Edwin would say to her, "I know where she will be" ...and he was always right. "Check by the coffee shop. That's where you'll find her." Number 1 Bennett Street is on the south side of Bennett Street where it joins Lansdown Road, and it only suffered minor damage. The Eye Infirmary was on the corner of the north side of Julian Road and Lansdown Road at Number 1 Belvedere, a short way up Lansdown Road from Bennett Street. To get to the shelter, Linda had to cross two side roads and walk past the 7 house frontages between these roads, uphill, a distance of about 120 yards (100 metres). The coffee shop was probably the one in New Bond Street Buildings. In the shop window was a machine that roasted coffee beans, with a vent in the shop-front to let out any smoke from the roasting. There was always a gorgeous smell of freshly roasted coffee near that vent. Use this Next button to view the next story in sequence.